Copy Paper: best for everyday printing. If you’re just printing a basic, all-text document, go with a cheap copy paper (aka multipurpose paper) like Universal Copy Paper UNV21200. Copy paper works just fine in most office machines. Inkjet Paper: best for printing graphics and images. Printing pictures or charts? Go with inkjet paper like Hammermill Inkjet Paper HAM105050. Printing images and graphics deposits a whole lot of ink on your paper. Inkjet paper is coated and treated to dry fast, so the ink won’t smear and the paper won’t get too wet and buckle. Running off your prints in a laser printer, or in that big multifunction copier at the office? Choose a laser paper like Hammermill Laser Print Office Paper HAM104604. Laser paper is specially treated for toner adherence, so you get smooth and fully opaque results. Plus, laser paper has a high brightness (that just means it’s really, really white). The higher the paper brightness, the higher the contrast, and the more vivid the printout. You can find more info on the different types of office paper in the On Time Supplies Office Paper Buying Guide. Description between differences was jut the information I was searching for. Great site. Thank you! 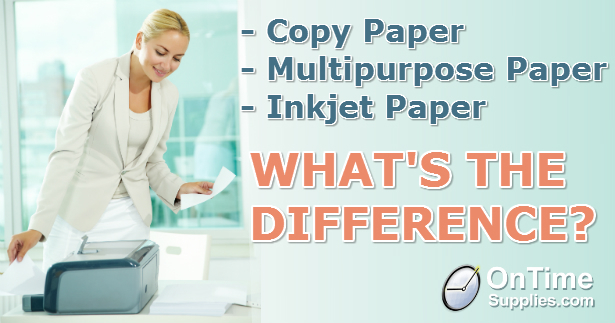 So, there is no difference between "copy" paper and "multipurpose" paper? Thank you! Hope you found this information useful. Have a great day!